What kind of animal was this, photographed in a Polish forest? Because this is one of the easier ones, tell me the exact species, please. Attribution, as always, to follow. Castor fiber, the eurasian beaver. Blamed for extensive flooding in Poland in 2010. Just because Castor fiber seems too easy, I'm going to guess it's an introduced Castor canadensis (which do exist in Europe). According to Wikipedia, "Eurasian beavers tend to be bigger, with larger, less rounded heads, longer, narrower muzzles, thinner, shorter and lighter underfur, narrower, less oval-shaped tails..."
Most of those features can't be distinguished by that single picture, except possibly for the shape of the tail. Based on that (I've seen C. canadensis often enough) I'm going with C. fiber for this individual. I'm actually wanting to say it's a Myocastor coypus. Castor fiber - Eurasian Beaver. If it isn't that, then the same photo on http://www.lhnet.org/eurasian-beaver/ is wrong. 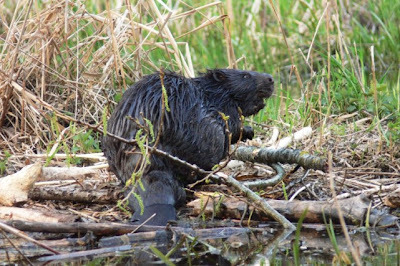 Circumstances have prevented me from writing the follow-up post today, but as Denis has revealed the image source I have to say that, yes, this is the European beaver. The best reply was definitely Paul's for noting the diagnostic features. The photo does show the longer profile and less rounded tail of the European species. As Mike indicated, the location that the photo was taken is not adequate to establish the animal's identity as, thanks to the wonders of the Steam Age, both the North American and European species can be found in Poland. The most obvious distinction with Myocastor is that the latter doesn't have the flattened tail. I've read single beavers don't construct dams or lodges, they just burrow in banks.